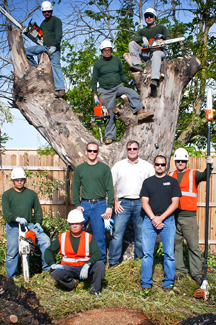 The Grove’s team of professionals is committed to providing exceptional customer service and state of the art tree care to our clients. Frank Carson founded Carson Landscape Industries fresh out of high school in 1975. Utilizing his pickup to haul equipment, he started in the residential market and gradually expanded into the commercial market. His innovative ideas for managing landscapes and his willingness to partner with property managers to lessen their workload launched his career. More than 35 years later, Frank is still going strong and in the fall of 2010 he launched The Grove, a total tree care company. Frank and his team of arborists are protecting the integrity and health of trees for clients through customized solutions.